The OSDSER unit is a product only suitable for engineers, system builders and others able to write software to control it. We regret that it is not a product usable by end users such as shop keepers, cctv installers or scrap metal merchants without those skills. The serial video text overlay unit is designed for applications where the data from a serial source needs to be displayed as a video overlay. The standard units are sold programmed with the serial command interface described below. This is provided to allow the unit to be controlled from a PC or microcontroller software program. The unit can also be programmed with user created application specific programs. In this way users can create interfaces for any device which transmits RS232 data. It is also possible to connect digital sensors to the board within the the OSDSER unit. Our EXAMCODE example software package is available as a starting point for development. 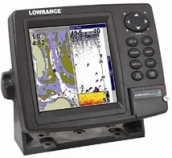 It provides example MPASM source code for interfacing the OSDSER to cash register data, GPS NMEA data, 1-Wire sensors and the MSF time signal. The OSDSER provides a simple platform for the development of microcontroller driven text over video applications. The unit uses a PIC16F628A microcontroller which allows for the use of the large amount of freely available source code on the web for sensor interfacing and other applications. 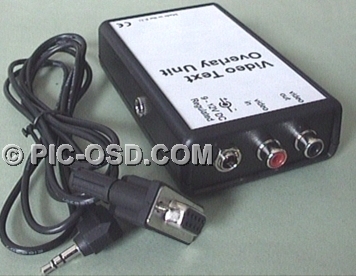 The OSDSER unit can be directly interfaced via RS232 to GPS, Sonar or POS units. 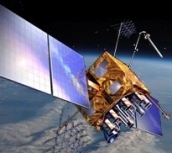 Digital sensors can also be directly connected to internal board. 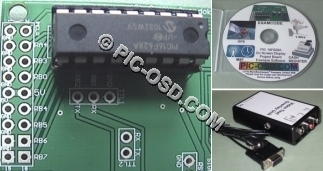 Any composite video signal source, from simple board camera to sophisticated ROVcan be connected directly to the OSDSER unit. Keypads, buttons and switches can be connected to the internal board to drive a user interface or automatically indicate status. Text and graphics generated by the project board can be overlaid on the video signal. 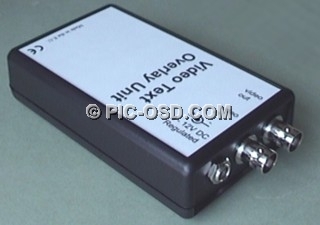 The OSDSER unit can also generate its own video signal. We do not have a generic application which runs on the OSDSER unit to display cash register or EPOS information. If you are a EPOS system builder and control your EPOS system software you can generate commands from your system to drive the OSDSER serial command interface program described below. See the EPOS builder FAQ for details. Alternatively users may write their own application specific EPOS interface software for the OSDSER based on our EXAMCODE example. Please see our cash register FAQ for more details. The OSDSER unit can be supplied with BNC connectors on request. Please email us prior to ordering. The OSDSER unit is housed in a smart ABS plastic enclosure with phono connectors for video in / out, and a 2.1mm DC power socket. Alternatively BNC connectors can be supplied on request. It is designed to be powered from the same power supply as the camera and so the unit does not have a power switch. A 1.2m serial cable with a female DB9 connector is supplied for connecting to a PC serial port or other RS232 serial equipment. The OSDSER unit is provided programmed with the character set shown below. This can be edited, modified or replaced as desired using the Maxim software and our fontset software which is available as part of our EXAMCODE example software package. Greek, Cyrillic and Hebrew character sets can be supplied as alternatives on request. As shown below when the full video frame is shown there are 16 lines of text ( PAL ). In most cases on a monitor you will see only 14 lines in PAL, 12 in NTSC. 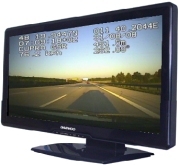 The serial command interface program allows the video overlay unit display to be controlled from a PC terminal program, microcontroller or other serial equipment. It can communicate at 2400, 4800, 9600, 19200 and 38400 baud ( 8 data 1 stop no parity ). The hyperterminal file, stv.ht, can be used to communicate with the unit. Fitness of this software for any specific purpose is specifically disclaimed. Each command consists of an upper case ASCII character which identifies the command. When a command requires a numerical parameter, shown as nn below, this parameter is entered as two ASCII numeric characters in the range 00 to 99. So 1 is entered as 01. The character string display and storage commands S & F display 28 character strings. The T command puts the system into typewriter mode. Characters are displayed on the screen as they are typed until a return is entered. 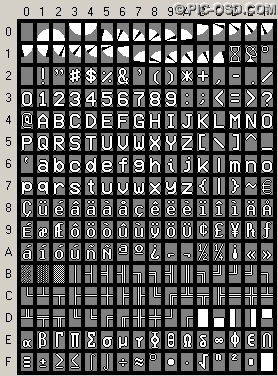 Characters for display can be entered as ASCII directly from the PC keyboard. = ASCII carriage return character, hexadecimal 0x0D. This character signals to the system that a command has been entered. The serial command interface program responds with the command prompt character >. All the serial commands take various times to execute therefore the return of the > character should be used to indicate that a command has completed. A Clears the entire screen. All character locations on the screen are filled with the space character. Cnn Sets the character position along the selected row ( X axis ) nn = 00..29. This value is stored in the unit and sets the position of the stored string. E Displays the string stored in the unit at the character and row positions defined and stored in the unit by the C & R commands, with the attributes stored with the O command. Fc0..c27 Stores the string entered in the eeprom memory of the unit. Up to 28 characters c0..c27 can be typed before entering a return character. The string is also displayed on the screen. The stored string is automatically displayed at start up and when the E command is entered.